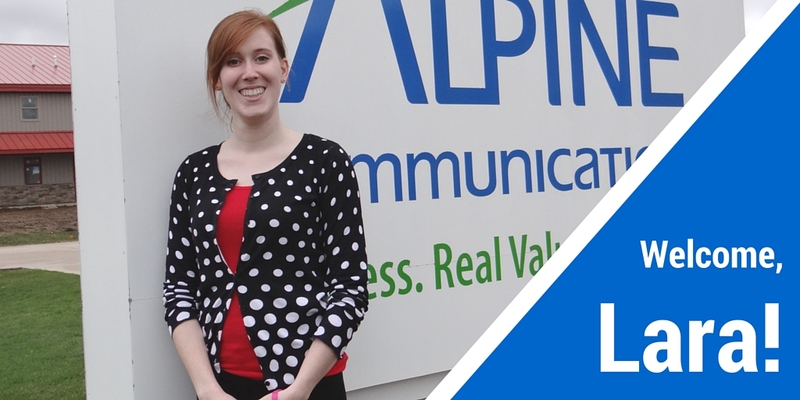 Please join us in welcoming Lara Duff to Alpine Communications as a customer service representative. Lara joined Alpine in March and her job entails assisting customers with signing up for new services, processing payments, and resolving service issues. If you are from the Elkader area, you likely know Lara from her eight-year career at the Elkader Swimming pool and for being the daughter of elementary teacher, Julie, and Elkader police chief, Marvin Duff. Lara previously worked at Clayton County Development Group and Cabela’s Distribution Center. She is a graduate of Central Community Schools and the University of Northern Iowa. Lara also has a brother, Alan, three cats, and many family members in the Alpine service area. During her free time, Lara enjoys road trips with good music and company, snagging deals at clearance sales and at consignment stores, and volunteering at the elementary school. She loves going to movies (and quoting them with her friends) and Lara’s favorite restaurant is Applebee’s.